In the back and forth over wind energy, one thing is clear. As Congress tries to come to grips with what to do about renewable energy, other countries have surged ahead with great focus. The effect has been powerful for the economies of China, India, Brazil, and much of Europe, where the contours of a major renewable industrial manufacturing base are appearing. Factories overseas are in overdrive, making bearings, gear boxes, generators, nacelles, turbine blades and towers, all the component parts that go into producing a wind turbine. There are strong indications that the same thing might happen might happen in the U.S. Even against the backdrop of the Great Recession, nearly $2 billion was invested last year to build, announce, and expand 55 wind-energy manufacturing plants. "That's just scratching the surface," says Liz Salerno, director of industry data and analysis for the American Wind Energy Association. The image that Salerno and other supporters of wind power have given us over the last few years is nothing less than the rebirth of the American industrial base -- and an explosion of green jobs. "Wind energy represents one of the greatest job-creation opportunities in history," William McDonough, the sustainable architect, told me two years ago. "We have to understand that it's coming, and then by design, deal with it intentionally." For Salerno, the answer today is in bearings, gear boxes, generators, flanges, and bolts. 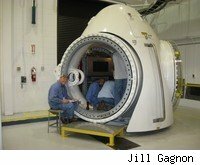 Big wind turbine manufacturers -- Vestas, Seimens, General Electric, Gamesa -- are really more assemblers, in that they put together all the finished component parts of a turbine that have usually been manufactured somewhere else along a many-tiered supply chain of vendors: smaller factories working under contract. The entire industry is sensitive to bottlenecks that develop in the supply chain: Just say the word "gear box" to a wind-turbine executive, and you're likely to get an eye-rolling response. Wind-turbine gear boxes are industrial miracles: a complex puzzle of machinery on a very large scale -- huge, heavy pieces of steel forged, milled, and assembled to incredibly close tolerances that whirl like Swiss watches. Because replacing them in the field can be very expensive, especially when the turbine is offshore, gear boxes are built to last. And factories with qualified machinists capable of churning out high-quality gear boxes are in short supply. In recent memory, gear-box manufacturers have been unable to keep up with demand. Bottlenecks have occurred, raising the price of wind turbines, delaying wind turbine projects and causing all sorts of downstream havoc. It's this sensitivity that makes nurturing wind power supply chain manufacturers so important to the wind industry. That's why current and up-coming legislation in Congress has, in fact, targeted component part manufacturers in the U.S. with tax rebates and grants or some combination of the two. "These are short-term solutions," says AWEA's Salerno. "What's needed is legislation that will send a signal to the big players -- to Vestas, to Seimens -- that the United States is committed to wind energy for the long term." It's happening in Faribault, Minnesota, where Moventas, a big European gear-box manufacturer, recently built a big plant. It's happening in Colorado, where Vestas is in the process of building four new factories in a big play to build out its supply chain base. In Little Rock, Arkansas, where an old Levi's jeans factory has been converted into a polymarin composite turbine blade factory. In Newton, Iowa, a former Maytag factory now produces wind turbine components. In Pipestone, Minnesota, Suzlon, an India-based wind turbine manufacturer, recently finished a 230,000-s.f. factory that will produce five sets of three turbine blades each week for use in the U.S. market. (The plant recently laid off half of its workforce, as a result of the recession, but says it plans to hire them all back soon). Acciona Energy has recently constructed a turbine generator facility in West Branch, Iowa, and while it, too, has laid off workers, the company is expecting a strong recovery. Indeed, small, economically depressed regions across America are starting to see that the wind industry creates jobs. According to Liz Salerno, 17 state, county, and regional economic development councils had tables at this year's AWEA Wind Power Convention in Chicago, which was attended by 23,000 people. In Fairless Hills, Pennsylvania, 20 miles from Philadelphia, Spanish turbine manufacturer Gamesa opened a turbine factory located in the Keystone Industrial Port Complex -- the former home of U.S. Steel. The place is so colossally big that when you visit it, as I did two years ago with Iberdrola's Brent Breerly and his father, George, who worked for 10 years at U.S. Steel, you realize that its scale is perhaps best conveyed not in acres but square miles. U.S. Steel had its own port, where iron ore was offloaded from ships, "red dirt with nuggets in it," George recalled, and it had its own railroad system. We walked through the recently refurbished tool works, a vertigo-inducing building where broken steel manufacturing equipment was once repaired, and which Gamesa now used to build wind turbine towers and nacelles -- the boxes on top of the turbine tower. Everything about the place smacked of new paint. When finished and installed, the diameter of Gamesa's rotor assembly is as long as a football field, encompassing the wingspan of a 747, and weighs more than 210 tons. A turbine comprises 8,000 parts, 40 percent of them sourced locally, in Pennsylvania or elsewhere in the U.S. Gamesa's locally sourced manufacturing target for the near future is closer to 75 percent. To do this, the company, like others who are expanding their supply chain in the United States, has developed a close relationship with local community colleges to train skilled employees. At its peak two years ago, Gamesa employed 1,200 people, all union jobs, working three shifts, 24 hours a day at this plant and a similar number at the flagship factory in Pittsburgh. Gamesa produces 20 turbine blades a week, 500 blades a year, but this scarcely begins to keep pace with the demand. "The future," Julius Steiner, Gamesa's U.S. CEO, "came pretty quick. We're just trying to catch up with it." Out in the field, Gamesa has struggled to find skilled manpower to construct the towers and build wind farms. I asked Steiner what kind of workers he needed most, and his response said something about the nature of the economic transformation that he and others at Gamesa are struggling to achieve here. "We need welders," says Steiner, who steps down from Gamesa at the end of August, to be succeeded by Jose Ignacio Llorente, chief business officer for manufacturing and operations. "We haven't trained any welders in the United States for about 15 years." The abandoned hulk of U.S. Steel that Gamesa now occupies was converted four years ago at a cost of $34 million. As the recession hit, the company decided to completely retool its manufacturing facilities, spending another $5 million to produce a newer, larger, 2.0 megawatt turbine, the G-90. "You should have seen this place when we first found it," said Steiner. "It was a complete wreck." Jose Louis Blanco, an engineer who accompanied me on the tour, recalled walking around the old factory for a while, thinking about the immense job that lay ahead, and then poking his head into one of the dusty old offices. Inside he found a kind of time capsule -- a desk, and on it a technical manual, opened to the page where the reader had left off, and beside it a pencil. "Then I saw the phone," Blanco recalled, "which was off the hook, but a light was still blinking on the console, as if someone had been put on hold for the last 20 years." We walked in silence by huge axels and five-ton gear boxes and massive hubs and nacelles and seven-ton, 140-foot turbine blades, each like a grand, sweeping dorsal fin, combining mass and grace and encompassing one's field of vision like a Richard Serra sculpture. "Would you ever have thought," said Steiner, at the end of my tour, "that a company from Spain would come to Pennsylvania and create a manufacturing industry?" But here was a humming factory in earnest -- and here, in the shell of an old steel plant, one vaguely felt a hint of something resurgent that seemed to have gone misplaced in America-or put on hold, perhaps -- for a very long time. Next week: the legislative challenge -- will Congress pass a (meaningful) national renewable electricity standard? Mark Svenvold, author of Big Weather: Chasing Tornadoes in the Heart of America, teaches at Seton Hall University in South Orange, New Jersey.